Janome Memory Craft 6600P Professional Computerized Sewing Machine With Exclusive Bonus Bundle $2,199.00 - FREE SHIPPING! A professional quilting model designed for precision and heavier use, the Janome MC6600P offers all the great features the Memory Craft line is known for and more. This computerized, semi-industrial machine has everything the serious quilter needs for convenience and great results. The long list of features on the Janome MC6600P begins with its large LCD screen and push button control pad, enabling easy selection of its 163 built-in standard and decorative stitches. Stitches also include alphanumeric fonts, 7 1-step buttonholes, and can be easily edited right on the screen. 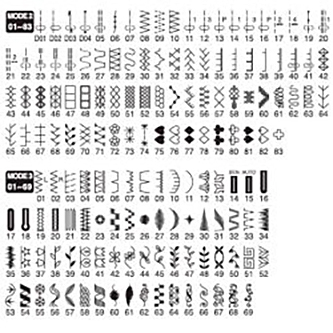 There is a handy snap-on stitch reference guide, and a threading guide. The MC6600P also has 5 memory banks to store edited stitch patterns for later use. Designed for quilting, the MC6600P sews at a quick 1,000 SPM, perfect for advanced sewists working on bigger projects. It has Janome’s exclusive Superior Feed System (SFS) and AccuFeed System, both developed for precision fabric feeding of different fabrics and many layers. 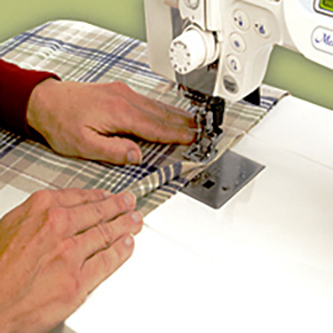 It offers drop feed for free motion quilting, a 7-piece feed dog, and extra-high presser foot lift with foot pressure adjustment and a convenient knee lift that allows the sewist to keep hands on the fabric. The Janome MC6600P has a deep 9" x 5” throat with plenty of working space and comes with a large extension table for even more working room. It can be used in a cabinet or with a quilting frame. Along with the many features packed into this amazing machine, the MC6600P includes just as many accessories. The kit comes with a dozen quilting and specialty presser feet, a quilting bar, a supply of bobbins and needles, spool holders, a foot control, and more. The bonus bundle adds a convenient rolling trolley, a top-load free motion quilting set, a straight stitch needle plate, an additional supply of bobbins and needles, and more of what every quilter needs to make the best use of this machine. There is also a 5-year extended warranty with the bonus model. 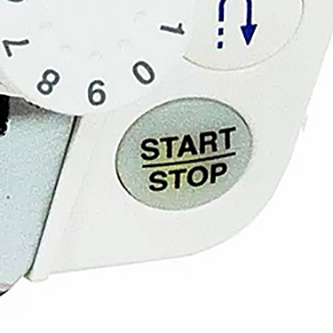 The Janome MC6600P comes with Janome’s standard warranty that includes 25 years on mechanical parts, 2 years on electrical parts, and 1 year for labor. The Janome MC6600P - A Professional Quilting Machine With Outstanding Features! 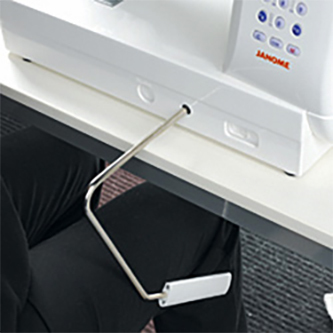 The Janome Memory Craft 660P features the AcuFeed layered fabric feeding system that makes sewing through thick material a breeze, as well as a seven piece feed dog system. As well as an extra high presser foot lift. Choose from dozens of decorative and quilting stitches. The screen has enhanced clarity and extra. All of the stitches are easier to choose, customize and save into memory. Raise the presser foot without taking your hands off your work. It's like having an extra hand. This is crucial for quilting and other projects with long or repetitive seams. 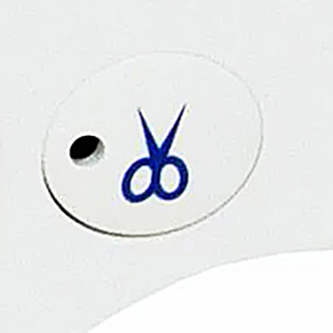 Just touch the key to manually snip your thread. You can also program the snip at the end of a stitch. Relax your pedal foot while doing those long seams or free motion quilting over a large area. The handy Start/Stop Button makes a big difference when you spend a lot of time at your machine. Spread out with the largest arm and bed space of any household sewing machine: 9 inches x 5 inches (225mm x 120mm). The design is not only spacious, it's also ergonomic and intuitive. 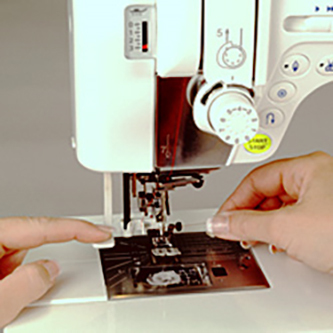 With it’s built-in needle threader and number thread guide, threading your machine has never been easier! 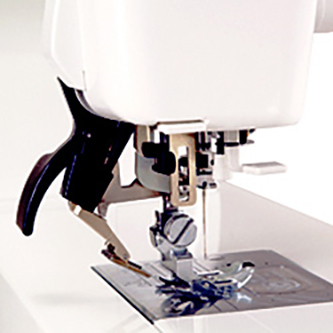 The Memory Craft 6600P also features a start/stop button, needle up/down button, an auto locking off stitch and an automatic thread cutter that makes completing projects faster. The tension keeps changing; must reset the stitch length after shut off, the automatic thread cutter cuts the bobbin thread so short I need to re-thread it after using it, cannot sewing over 4 layers of material, this machine cannot start sewing at the beginning of the fabric, or it will jam the bobbin. I am glad I lease this machine for 12 months. Can't wait to return it to the leasing company (Get Finance) Pay tomorrow. Always least because this company only gives you 30 days to return. This machine is a dream! It's a very sturdy workhorse, and it can tackle just about anything! It comes with the Accufeed system - when engaged, it works like a walking foot. It is so easy to use - very intuitive! People have asked me when I am going to get a newer model, and my answer is, "Never!" I am not tempted in the least to "upgrade." I love this machine!!!! Purchased this machine in 2008 after using it in a class at MQX. It has performed reliably and without requiring any repairs. Love all the beautiful stitch options. This machine is easy to operate and intuitively designed.